The Only Freedom reveals the possibility of attaining a state of permanent freedom. It is not the freedom we experience when we recover from some disease, for in that state we always know or expect that some other ailment can afflict us. It is not the freedom from lack that a wonderful new job or large inheritance may bring, for these also can fail us. 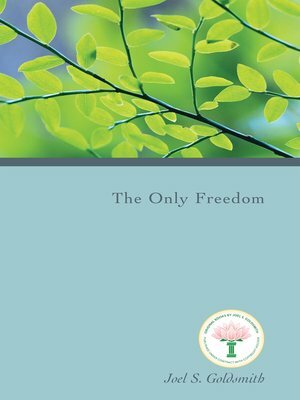 The freedom described in The Only Freedom is a freedom already within us, but which can be reached only through the discipline of knowing the truth – the truth about God, man, and the nature of error – and standing firmly in the principles behind these truths. As Goldsmith says, "If we are not abiding in the Word and letting the Word abide in us, all the evils of this world can come near our dwelling place." Throughout this book Goldsmith shows us how to find "the liberty of the sons of God" within ourselves. He says that it may not be easy, but that freedom and fulfillment will be the end result: "Wherever there is a realization of God, man is given his freedom, not only spiritual freedom, but a spiritual freedom which becomes evident as physical, mental, moral and financial freedom."